Ever go to an airport stressing out that maybe, just maybe your suitcase is too heavy? Then find out that it is and you have to either sift through your case and take out something, throw some things away or pay an overage fee to the airline. It can be annoying and extremely stressful. To eliminate this worry, for just a few dollars you can invest in a small luggage scale that you can keep with you when you travel to avoid this undue stress and worry. It is well worth it to eliminate your fear of having to mess with it at the airport; a peace of mind and a little life saver. When you travel especially overseas and you have to change to a smaller airline as I did, flying from Ireland to Scotland the restrictions on baggage may change. 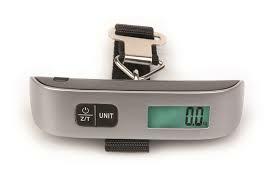 Having this scale with you can save you time and energy and will keep you in compliance with big and small airlines. A nice little gadget to have handy.